Indian Village is a historic neighborhood located on Detroit’s east side and is listed in the U.S. National Register of Historic Places. The district has a number of architecturally significant homes built in the early 20th century. A number of the houses have been substantially restored, and most others well kept up. Many of the homes were built by prominent architects such as Albert Kahn, Louis Kamper and William Stratton for some of the area’s most prominent citizens such as Edsel Ford. Many of the homes are very large, with some over 12,000 square feet (1,100 m²). Many have a carriage house, with some of those being larger than an average suburban home. Some of the houses also have large amounts of Pewabic Pottery tiles. The neighborhood contains many historic homes including the automotive entrepreneur Henry Leland, founder of Lincoln and Cadillac, who resided on Seminole Street. Indian Village has a very active community including the Historic Indian Village Association, Men’s Garden Club & Woman’s Garden Club. The neighborhood hosts an annual Home & Garden Tour the second weekend of June, a neighborhood yard sale in September, a holiday home tour in December, and many other community events. Promoting the continued development of Historic Indian Village as a prestigious residential district. Conducting litigation for the enforcement of the single-family residence ordinance and building and use restrictions on property within Historic Indian Village. Doing things necessary and suitable for the general welfare and betterment within Historic Indian Village. Supporting an archive collection established in 1973, which has gathered and microfilmed original blueprints, photographs and historical records of interest to this area. The Historic Indian Village Association is your association. It is here to protect your interests and assist you with the requirements of living in a historic district. The Board of Directors holds a public meeting once a month. Everyone is encouraged to come to the meetings, join the association and help out on a committee. The Centennial Garden was created in 1995 by Historic Indian Village residents to commemorate its 100th anniversary, on three lots at the corner of Seminole and Charlevoix Avenues owned by Dr. and Mrs. William Kirtland. The lots were donated to the Historical Collections and leased to the Historic Indian Village Association. They are maintained by the Indian Village Men’s and Woman’s Garden Clubs from funds earned from the Indian Village Home and Garden Tour each year. The Garden was designed by landscape architect Nancy Harris to resemble a century-old Victorian garden, replete with plantings typical of that period. The land was cleared, stripped of sod, and graded for the site. 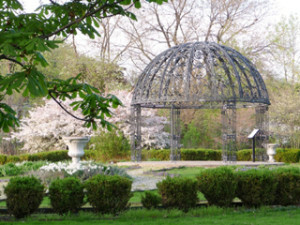 Years of planning and organizing then went into gathering supplies and volunteers for a 184’ x 200’ garden anchored by a central gazebo, protected by antique wrought-iron fencing secured by residents from the Water Department, and containing “century-old” urns and benches to accompany turn-of-the century plantings. Special events may be held in this wonderful location with a $250 damage-cleanup refundable deposit, a $150 suggested donation for the upkeep of the Garden, and a signed event agreement. No alcoholic beverage is allowed in the Centennial Garden as a City zoning requirement. Since there is no lighting in the Garden except for the dome, all group activities need to be scheduled during daylight hours. Any decorations must be appropriate to the nature of the Garden and not on the gazebo because of possible damage to LED lighting. Sound systems must be held to a level so that sound is only available to the event itself and is not at a level to disturb neighboring residents. Donations to the Centennial Garden should be made by check made out to Indian Village Historic Preservation Association. In fall 2006, the Boards of the two garden clubs met together and explored the idea of replacing the small wooden gazebo in the Centennial Garden with a more historically appropriate wrought iron gazebo as a joint community investment project. Once the Board members saw the wrought iron gazebo that a Detroit wrought iron designer and craftsman, Carl Nielbock, had in his work yard, it became the target. Garden club members and residents were enlisted to support the project, and each of the garden clubs appropriated $20,000 to purchase the gazebo. A proposal was written and an additional $10,000 was secured from the Trevor Fetter Family Fund to complete the project. Months were spent obtaining approval from the Detroit Historic District Commission and the City Engineering Department, but finally the gazebo was installed the day before the 2007 Indian Village Home and Garden Tour on June 2, 2007. Since then Indian Village resident, Todd Sanford, has installed LED lights on the dome. Impressive as it is during the day, at night the dome floats over the Garden lit as if by moonlight. The Indian Village Greenspace consists of three lots on Iroquois right behind the Indian Village Market, from which two homes were removed in the 1950s and which were deeded to Indian Village Association in the 1970s. In the 1990s, the Indian Village Men’s Garden Club cleaned up the area, and in 2002 secured a Greening of Detroit grant to plant native trees and bushes in the space. In 2005, Indian Village Collections received a grant from the Trevor Fetter Family Fund to establish a historical marker and beautify the space in memory of the Scranton and Trevor families who occupied a home on the site. A red granite stone marker has a plaque showing the home and the family who lived there, and is located on a garden space planted with native Michigan plants. Two Indian Village gas lights illuminate the area at night. A committee of residents planned the area, obtained the necessary permits, secured the design and planting of the area, and arranged for the installation of the lights. In the spring of 2006, a dedication ceremony included the great-grandson of the original residents. The area is maintained from part of the grant and community volunteer assistance. The Indian Village Historical Collections, Inc. (IVHC) functions as the historical society for Historic Indian Village. Materials are available for viewing and research by appointment. The collections are located at Iroquois Avenue Christ Lutheran Church, 2411 Iroquois. The IVHC was incorporated in 1980 to carry on the historical activities of the HIVA’s preservation and promotion committee. The IVHC is a volunteer, nonprofit, research and educational organization recognized under Section 501(c)3 of the Internal Revenue Code. Memorabilia pertaining to Historic Indian Village houses or the people who have lived in these homes is continuously being collected and organized. The IVHC has many resources of interest to residents. There is a file for every street address in the Village. These files contain data such as when and for whom the house was built, the name of the architect, often some biographic information about former residents, as well as pictures of the home. The Historical Collections’ materials may not be removed from the premises. However, residents are encouraged to use the combined resources of the Historical Collections by appointment. The IVHC is the repository for the records of the Historic Indian Village Association dating back to its founding in 1937. Records of the Indian Village Branch of the National Farm and Garden Association, and the Indian Village Men’s Garden Club are also in the archives, as well as booklets and reports from Home and Garden tours. The IVHC assists in the preparation of both the tour booklet and the walking tour guide for the annual Indian Village Home and Garden Tours. IVHC is an ongoing research project requiring many volunteer hours. Any villager interested in doing research on the history of the area is encouraged to talk with one of the board members and to join us as a volunteer at the collection headquarters. The Indian Village Historic Preservation Association (IVHPA) was incorporated in 1993 in an attempt to combat the deterioration of historically and architecturally significant structures and areas within the Village. It was also formed to educate the community regarding the historical and architectural importance of the Village, and to undertake fundraising activities that will help preserve the area for future generations. In anticipation of the celebration of the centennial anniversary of Indian Village, the IVHPA was formed, with the blessing of the Indian Village Association Board of Directors, with the intent of being an independent organization dedicated to the preservation of the community to help preserve the Village for future generations. With this in mind, the IVHPA applied for and was granted 501(c)3 status by the Internal Revenue Service, thus allowing individuals to make tax exempt donations to the organization. The initial project of the IVHPA was to solicit funds to construct a Centennial Garden on three donated lots in the neighborhood. The Historic Indian Village Association, Indian Village Woman’s Garden Club, and Indian Village Men’s Garden Club were approached and each organization agreed to donate funds toward the restoration and erection of historic fencing around the garden which came from the nearby Water Works Park on E. Jefferson Avenue. Through many hours of hard work, as well as financial contributions by numerous villagers, the centennial garden was completed and dedicated in 1995, the centennial anniversary year of Indian Village, thus leaving a visible and permanent legacy that would benefit the area in and around Indian Village. Historic Indian Village is a thriving and respected neighborhood today because of years of vigilance by dedicated neighbors to maintain the integrity of our grand historic homes. Due to its historic district designation, specific guidelines and specifications must be followed for the exterior maintenance and appearance of homes in Historic Indian Village – over and above the City of Detroit ordinances. Along with the historic district recognition came the responsibility to maintain the exterior of Indian Village homes within certain guidelines specific to Indian Village – called the Elements of Design. Any and all changes to the exterior of the home – including changing paint color or major landscaping changes – can only be made with approval from the Historic District Commission AND obtaining a permit. As a first step in the procedure, residents who wish to change or add to their exterior are requested to bring their plans to an HIVA monthly Board Meeting. The Commission will determine the appropriateness of the proposed changes and may take one of several actions – approval, denial, or modification of the proposal. The Indian Village Elements of Design, adopted by City Council in February 1982, ensure that Indian Village home exteriors meet historical guidelines and protect residents from “outrageous” improvements such as additions, demolition, or changes inappropriate to a building in a historic district. All year long, there are entertainment events all over the city of Detroit for every taste, flavor, and persuasion. We will post relevant entertainment events and venues here. Please contact us with your favorite entertainment events or links so that we can add them to our list. Dusing Security & Surveillance (DSS) provides a private security patrol to Indian Village, West Village and Berry Subdivision. Dusing offers monitoring of alarm systems for residents, and when on duty, the security patrol will respond immediately when a monitored alarm system is triggered. The alarm monitoring fees pay for most of the cost of the patrol, and as more residents subscribe we can add more patrol hours, so we strongly encourage residents with alarm systems to subscribe with Dusing! Indian Village also has HASP, the Historic Areas Security Patrol, a volunteer citizens patrol which supplements the Dusing patrol. This patrol covers Berry Subdivision, Indian Village and West Village. If you’re interested in volunteering or you just want more information, please contact us. Indian Village maintains a close relationship with the Northeastern District of the Detroit Police Department, and holds monthly meetings at the district with DPD representatives.